We arrived in Cap Haitien on Saturday afternoon and drove out to the Open Door mission in Bois de Lance. On Sunday morning we went to church and noticed a child with a red eye. After services, we were told she was one of the 25 orphans. Mitch and I started looking at all the children from the orphanage since the little girl had conjunctivitis. We gave the caretakers drops to treat the girl and told them to take contagion precautions, quite the challenge in an orphanage in Haiti with 2 caretakers for 25 children. We also told them to bring any child in who had red eyes or tearing so that they could be treated. 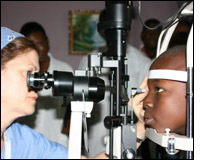 Monday and Tuesday we examined patients for ocular diseases and dispensed glasses and dispensed necessary medications. We saw conjunctivitis, traumatic iritis, corneal scars causing significant vision loss, cataracts, glaucoma and retinal vascular diseases, just to mention a few. We sent the patients who needed further workup and treatment to see us later in the week at Justinien hospital so that they could also follow up with our Haitian colleagues. We saw approximately 120 patients over one and a half days. Wednesday, at Justinien Hospital in Cap Haitien, we examined the preoperative patients on whom our oculoplastic surgeon, Kayvan Keyhani, MD, would operate. The first patient was a 3 month old with microphthalmos, a disorder in which the eyeball is underdeveloped and the vision is usually poor or nonexistent. This baby was blind and it was devastating to give this news to the parents. She was brought in because of "droopy eyelids"; no one realized she had such abnormal eyeballs and was blind until we demonstrated this. The other patients examined included traumatic eyelid disorders, orbital tumors, eyelid tumors, tumors of the eyeball, and severe infections of the eyelids. Thursday and Friday Kayvan performed surgery on the adults, but was not able to operate on any of the children because the only anesthesiologist at the hospital decided she did not want to do the cases. We were devastated but forged forward, taking care of the people whom we could help. We donated antibiotic, steroid and glaucoma drops to be dispensed to needy patients, and supplies for the clinic and operating room. We are committed to returning twice a year to continue educating and assisting our Haitian colleagues.